I am not a racist and I don't prefer a certain skin color over another. How ever this photo shocked me so much that my wife had to pour buckets of warm water on my face to bring me out of the shock. I am now on the lookout for a bride for a good friend of mine. When ever he shows a picture of a girl in a matrimonial site, I would immediately ask him to check the girl's picture on social media sites. If she is not on facebook, I ask him to directly go and meet her to check if she looks the same. My friend did not understand the seriousness of my lines. So I am writing this post so that he gets it. Imagine seeing a prospective bride's picture on a matrimony site. Put yourself in the prospective groom's shoes. You see her picture and you immediately fall in love with her. Then you go and meet her and still you are floored because she is hidden under a 1 inch thick coat of paint. Then you get married and after the Suhaagraat (first night) is over, she takes a bath and you end up seeing some other person standing in front of you. Would not you get a heart attack? To avoid all these problems, ask the girl to send a Drving License photo. If she says that she does not have a driving license, ask her to send her Aadhar card or voters ID photo. If she still says that she does not have any of these, ask her if she can wash her face in front of you. If she agrees to this, go and meet her with a vessel-washing-scrubber. Some times you have to use a steel scrubber. Nerolac paint does not come off easily. I have nothing against people who do not have a glowing skin. I also do not have any problem against people who groom themselves well to appear good. 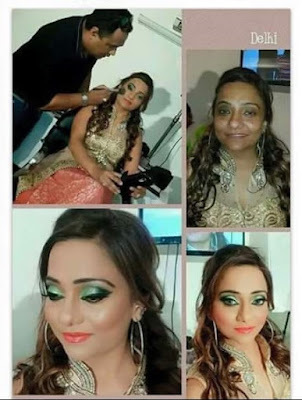 I remember a class mate of mine who used to apply layers and layers of paint on her face ( she calls that as make up). When we celebrate Holi in college, she used to come and hide behind me and say "Chriz, I am scared of colours. Please save me from those who are chasing me to apply colours on my face". That was the last time I played Holi. Note: Men apply lot of make up too. So if you are a bride looking out for a possible groom, follow all the points mentioned in this post. Right on target Prason....there is this treatment made famous by Michael Jackson ...the Chemical Skin peel ....... Now it is remarketed as Skin Lightening ....then there is lazer....very much in demand. A few Ugly ducklings get a chance to play swans for a few months at a time.... there could be cancer waiting down the bend. Shall we republish on South Inkk? Ugly ducklings? Seriously? If alone God gave every human newborn a checklist that said: "#1 tick the box which has the sample of the skin colour you would prefer to live with all your life. #2 tick the box which has the way you want to look all your life: Super hot, semi hot, moderate, mokka, super mokka", everyone will be attractive according to earthly standards, ok? Feeling content with what we have and how we look, comes with experience or circumstance. Extremely unfair of you to call people "ugly ducklings". Ugly, according to whose standards? Yours? Maybe they look beautiful to my eyes. Who are you or who am I to set beauty standards even? And moreover, it is their effing right to look or feel the way they want to. Don't play the moral police here. You or I, we're not the ones to judge. Get that clear first and foremost. Sorry if it came as too harsh. It sounded a little less intense in my head at least. @Ranki Hunt : Absolutely true. When people apply make up to present themselves well, it is good. At the same time, when they don't like their looks and completely become someone else by wearing a mask, their inferior complex gets exposed. Thank you so much Ankita. This blog has all the ingredients to offend people. Had to walk on a thin tight rope while penning this. The sad reality is many of us are not happy with the way we look and aspire to be like some one else. HA HA .. U are Awesome .. Very Humourous . Funny post that does at the same time reflect the attitudes of society towards dark-skinned people, does it not? Is it really strange that people resort to such measures when the society is so obsessed with fair skin? Driving licence, AAdhar card, voter ID :D :D Hilarious chriz. carefully penned and made the right balance required. Well done. hahaa hilarious man..good one..do you the know origin of this pic?